Danny Spewak (@dspewak) is a Big 12 microsite writer. He filed this report after Oklahoma State’s 74-72 victory over Baylor in the Big 12 quarterfinals. Tough, Tough Loss For the Bears; What Now? So Close: It was a worst-case scenario for Oklahoma State. Pierre Jackson was wide open, and he was about to let it fly. For the win. “I wasn’t real excited about watching him run down the court wide open,” OSU coach Travis Ford said afterward. It seemed like fate. The shot would save Baylor’s NCAA Tournament at-large hopes. Jackson had already scored 31 points, most of which came during a frantic comeback from a 20-point deficit, and he was about to prove to the world how much of a travesty it was to leave the Big 12’s leading scorer and assists man off the all-Big 12 First Team. Except he missed. Pierre Jackson’s game-winning attempt, which he took on the move after splitting a few Oklahoma State defenders, did not fall, as fate would have it. “I feel like I let them down a little bit,” Jackson said. He didn’t. His performance was nothing short of legendary late in the second half, as he made tough shot after tough shot in crunch time. But the Cowboys survived, and the loss probably relegates the Bears to the NIT. Marcus Smart said he had one thought as he watched Jackson’s shot: “Oh crap.” Baylor was in that position after Phil Forte drained two controversial free throws, thanks to a foul call on Deuce Bello that may or may not have been legitimate. If you listen to Twitter, the whistle was an abomination. Regardless, Baylor got bounced from Kansas City, and it’s hard to imagine this team grabbing a bid on Sunday. 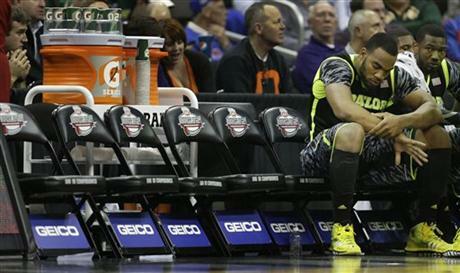 Too Little, Too Late: Baylor nearly completed a thrilling comeback. That’s great and all, but the Bears could not have looked any worse in the first half. They trailed by double digits right out of the gate, got beaten to every loose ball and looked like they wanted to be anywhere but at the Sprint Center. It’s commendable that they fought back, yes, but this was a microcosm of Baylor’s season. It beat Kansas on the final day of the regular season, but it’s about an overall body of work. In a basketball game, it’s about how you play for 40 minutes, and the Bears just dug themselves in too deep of a hole. Star of the Game: Pierre Jackson takes this award in a losing effort. He was spectacular in every facet of the game, and we’re guessing not a single person in the arena thought he’d actually miss that final shot. “We knew Pierre would make a spark for his team,” Smart said. “We definitely dodged a bullet with that last shot.” We’d like to give another award to Le’Bryan Nash as well. He didn’t lead the Cowboys in scoring, but he made a couple of key baskets late in the game to fend off Baylor. He finished with 14 points overall and fought through individual adversity late in the game. That’s a sign of maturity out of the sophomore. Sights and Sounds: Jackson was inconsolable after the game. He fell to the floor and remained there for several seconds until his teammates went to grab him. Travis Ford then walked away from the postgame handshake line to seek out Jackson personally and give him a few words of encouragement. That was a nice moment to see after an emotionally-draining game. 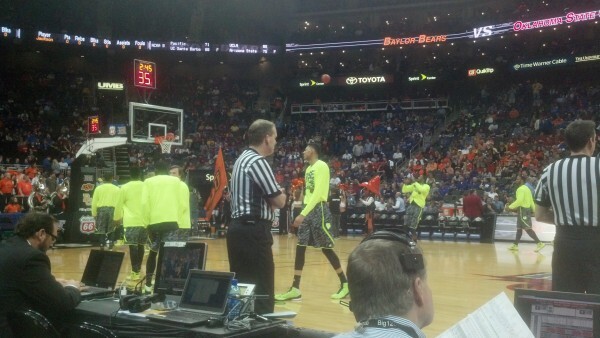 Wildcard: Baylor’s uniforms have been a topic of discussion since the beginning of time, but you’ve got to see a picture of these guys’ warmup suits. How does this not hurt your eyes (note the glow)? Quotable: “Everyone that stayed saw a heck of a game.” –Baylor head coach Scott Drew. What’s Next: Oklahoma State advances to play Kansas State in Saturday’s semifinals. This entry was posted on Thursday, March 14th, 2013 at 10:45 pm by dnspewak	and is filed under 2013 conference tournaments, big 12, microsites. Tagged: baylor, big 12 tournament, marcus smart, oklahoma state, pierre jackson. You can follow any responses to this entry through the RSS 2.0 feed. You can leave a response, or trackback from your own site.